Before delving into this article, you may want to read the Wild Gears page so that you know what it’s about. The manufacturing methods are very different for the two products. 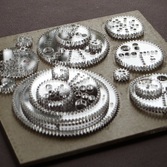 Wild Gears are laser-cut on demand from a flat acrylic sheet. Spirograph pieces are mass-produced in molds. These different production methods necessarily have consequences. Wild Gears pieces are flat on both sides. Wheel numbers are cut into the pieces with the laser cutter. Holes are not numbered. 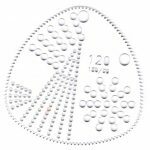 Spirograph pieces have raised markings, created by the mold, which allows for a lot of detail: hole numbers, alignment marks etc. Spirograph pieces are thicker around the edge, where the teeth are, than in the middle. The inner parts of the wheels don’t touch the paper. This allows them to be lighter, and reduces the friction between the wheel and the paper. Wild Gears are an even thickness throughout. Because they are heavier, and because there is more friction between the gear and the paper, more force is required to move them. I find that the felt pens, with their skinny (~1 mm) tips, sometimes feel rather delicate for the task of pushing the gear around, especially for the bigger gears. However, I haven’t bent or broken anything yet! Sometimes the force required to move a large gear around has required a helping nudge by my other hand, especially with larger pieces and outer holes. Because there is more contact between the gear and the paper with Wild Gears, ink that doesn’t dry quickly is more likely to smear. 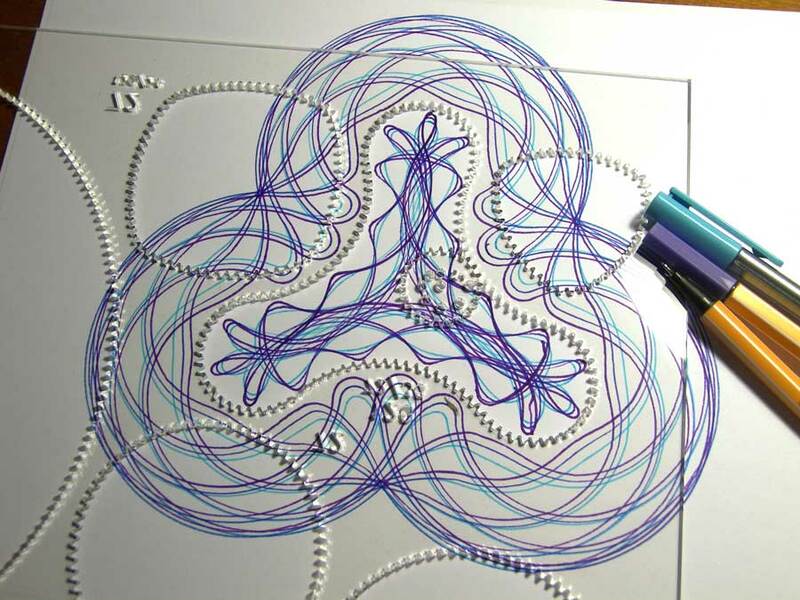 This is most noticeable with high-gloss paper, or viscous gel pens, and can also happen with Spirograph. Spirograph has smaller teeth. The two products are not at all compatible with each other. 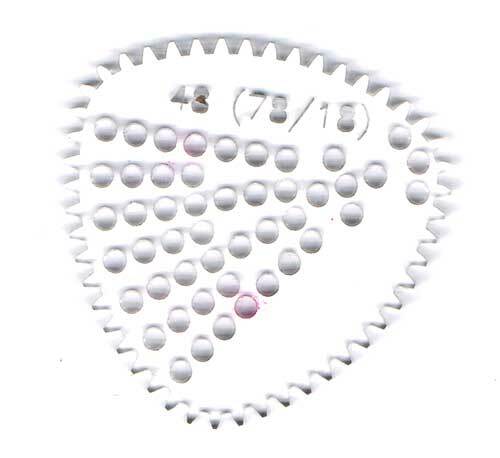 Wild Gears’ triangle gear 120 (180/60) has 3 different sizes of holes. One of Wild Gears’ most interesting features is the different sized holes to be found on a single gear. They allow parallel patterns to be drawn when you use a larger hole and then a smaller hole. Looking back at my post on hole size and pen size, it was about very small differences in hole size. Wild Gears shows how those differences work on a larger scale. 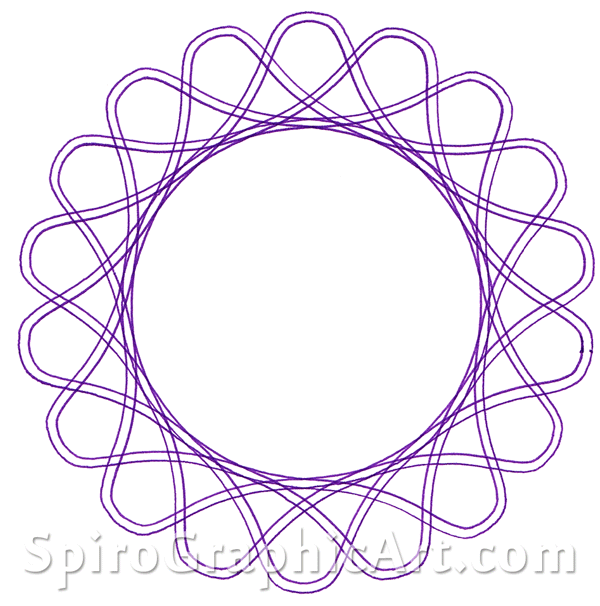 Spirograph holes are all arranged in a spiral. The distance from the edge increases by less than 1 mm from one hole to the next. 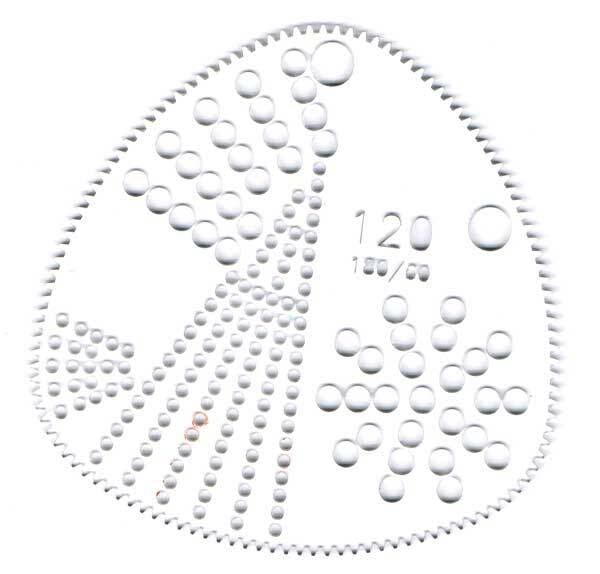 If you are drawing a design with many patterns using different holes on the same gear, you have to line up each hole very carefully with a mark on the ring to make your design work the way you want it to. Wild Gears holes are usually lined up in a row. 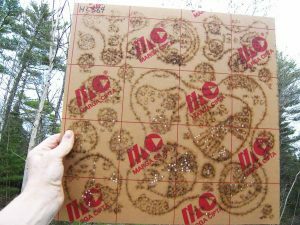 This makes it easier to draw patterns using many holes. The lack of markings on the gear is less of a problem as the teeth are bigger. Having the holes lined up in a row means there has to be more radial distance between the holes or else the gear would fall apart. However, many gears have a second row of holes that give you intermediate positions. The triangley shape, which you can draw outside or inside – or both. 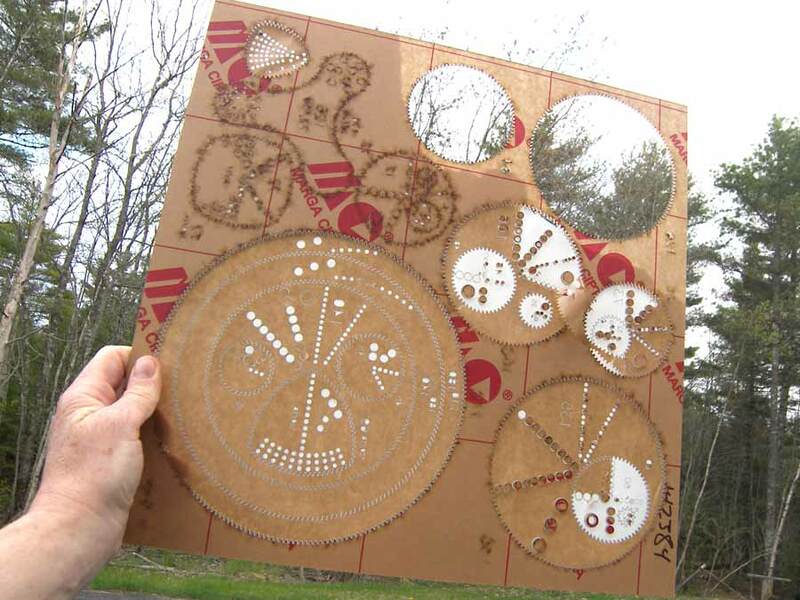 Every Wild Gear cut out of the acrylic sheet leaves behind a corresponding ring with the same number of teeth. The high quality of laser cutting means there’s virtually no gap between parts. Thus there are lots more rings to use, with many possible permutations and combinations to explore. There are rings in interesting shapes as well, such as the blobby triangular thing. The result? 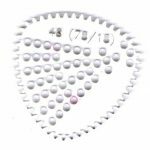 You can make hypotrochoids (inside designs) in many different sizes, from an inch in diameter to a full 8.5 x 11″ page and even bigger with some of the sets available. 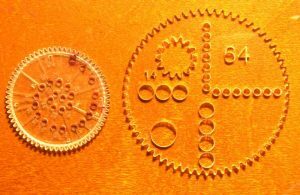 Spirograph has only two rings, and the sizes are similar: one has 105 teeth on the inside, and the other has 96. 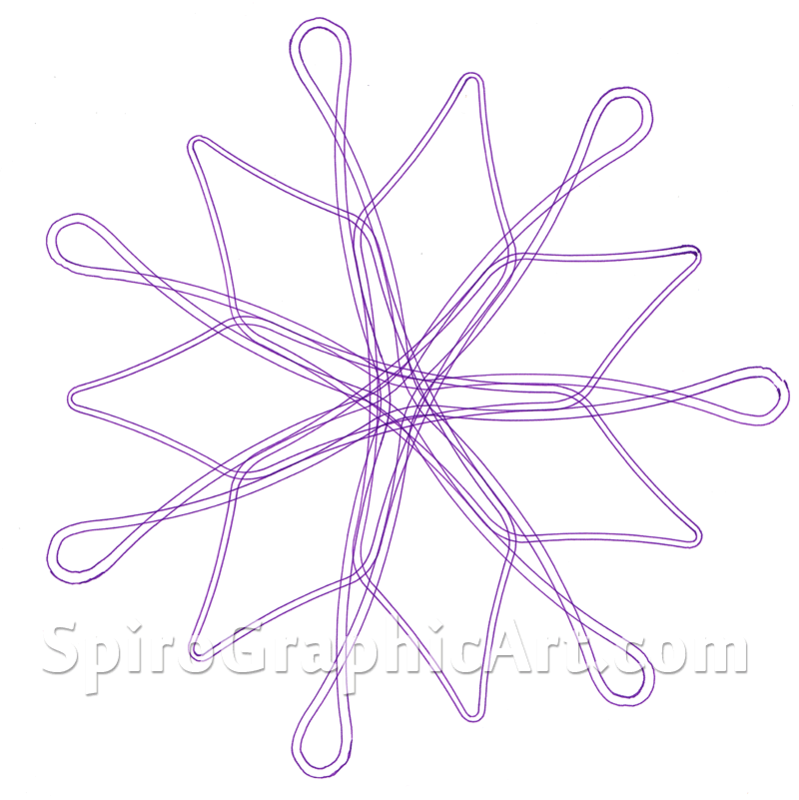 Other shapes can be created with Super Spirograph parts if you have them. The curves are the same radius as the 144/96 ring. Kahootz Toys has a new Super Spirograph in the works. Epitrochoids (designs made around the outside of a gear) can be made in large sizes with both sets. Hypotrochoids are generally more interesting, however. The Strange Shapes Gear Set, fresh from the box, backing paper still on both sides. 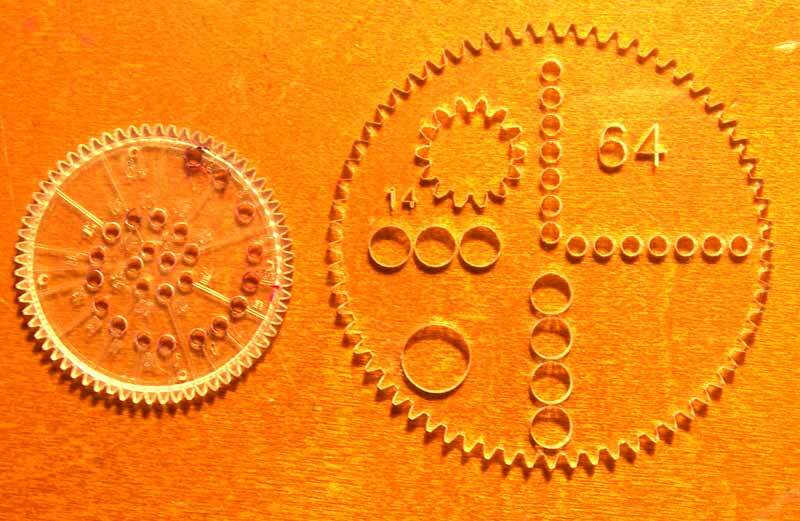 The Spirograph toy was developed so that all the gears would work with both rings. No disappointed kiddies. Wild Gears has so many different-sized rings and wheels, and different shapes as well, and some just won’t work together. Don’t be disappointed! Be an adult about it, and find ones that do work. That’s why I call it “Spirograph for Grownups”. It demands a little more of you, but offers very interesting rewards. Ring 144-96 with wheel 72, holes 1, 3, 5, 7 etc. Design on left with my old Spirograph, on right with the new set, showing less precise alignment and radial distance of holes in the new set. Hole alignment is important for precise designs. Are the holes lined up with the teeth or with the gaps between them? 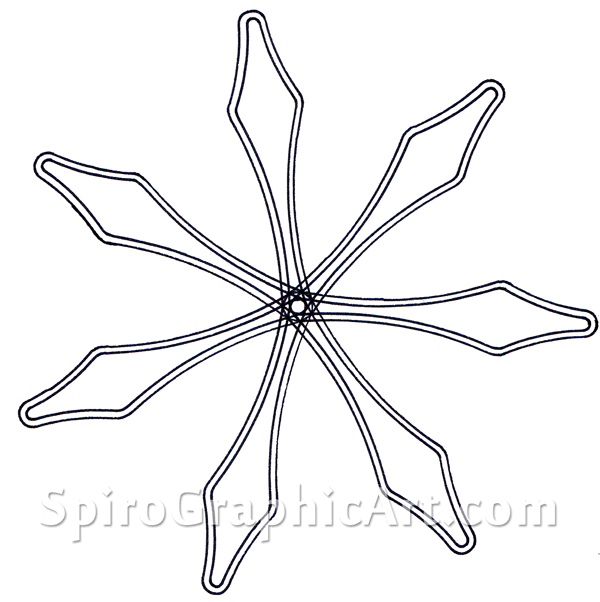 With Spirograph, it seems to be about halfway up the “hill”. The new Spirograph is less precise than the old in having all the holes lined up properly, as I’ve observed when drawing identical designs with the two sets. The makers of the new Spirograph made the holes bigger, but with the same layout, so there wasn’t as much room to fit the holes in, and the result was a less precise drawing tool. Too bad. Wild Gears parts are precisely laid out. But there are times when you need to be aware of whether a particular set of holes is lined up with a tooth or with a gap. Most holes line up with a tooth, but you should check the alignment if you’re mixing and matching. One of the sets of Wild Gears available, the Encyclopedic Gear Set, provides two wheels of each size, A and B. The holes in the A gears line up with a tooth, while the holes in the B gears line up with a gap. This allows you to make designs that use both hypotrochoids (inside a ring) and epitrochoids (outside the corresponding wheel) to line up properly. Clever. But this is a layer of sophistication that grownups (or seriously obsessed kids) are more likely to appreciate than the average user.